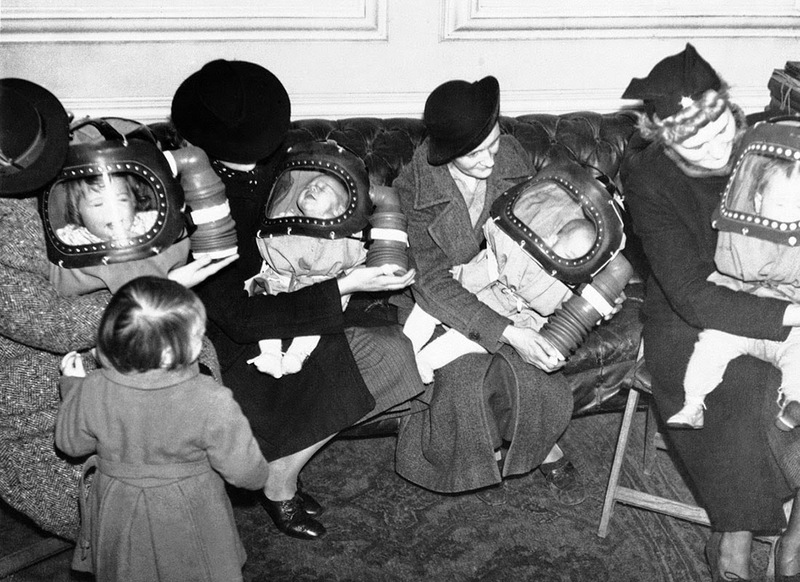 Gas masks for babies tested at an English hospital, 1940. The hospital is running a drill to make sure that they can implement the procedures for poison gas and in this case the nurses are testing out infant gas-masks. 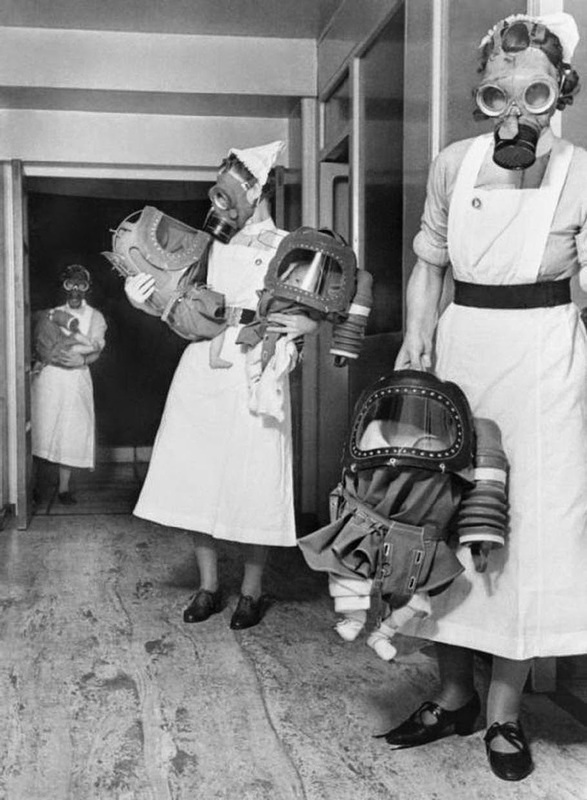 The photo is part of the Imperial War Museum in London and the original caption reads: “Three nurses carry babies cocooned in baby gas respirators down the corridor of a London hospital during a gas drill. Note the carrying handle on the respirator used to carry the baby by the nurse in the foreground”. This gas mask was for children up to two years old. The design covered the whole of the baby except for its legs. In 1938, the British Government gave everyone, including babies, gas masks to protect them in case the Germans dropped poison gas bombs on Britain. They were carried normally in a cardboard box or in some cases a tin box and had to be taken wherever you went. Children were issued with colored masks to make them feel less scary. Babies had special cradle-like respirators which would only be issued out if an emergency situation arose. Babies were put inside the case and when all the covering flaps were folded and the straps closed up, the baby was totally enclosed. There is an asbestos filter on the side of the mask, and this absorbed poisonous gases. Attached to this is a rubber tube-shaped like a concertina with a handle. This was pushed back and forth to pump air into the mask. With the baby inside the mask, an adult could start to use the hand pump. During demonstrations there were reports that babies fell asleep and became unnaturally still inside the masks. It is likely that the pump didn’t push enough air into the mask and the babies came close to suffocating. Luckily, they were never put to the test in a real situation. Mothers outfitting their children with “baby helmets”. It was my job aged four to demonstrate that gas masks were fun to wear as children were terrified of them. When there was a panic for three days and nights we had to measure and fit the masks. were too busy to bother.